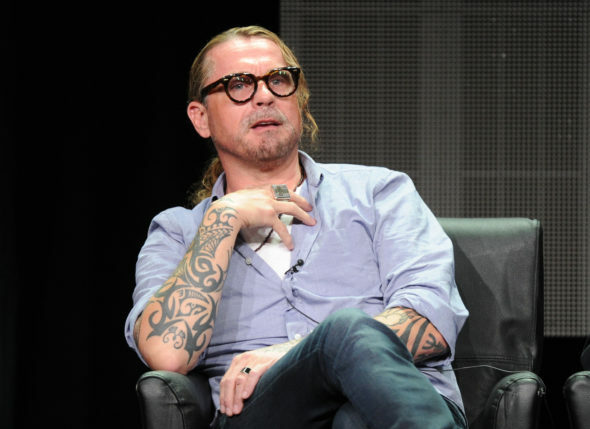 Pictured: Kurt Sutter (Frank Micelotta / FX). Deadline reports that footage from the Mayans MC TV show pilot was included in the promo for the new subscription FX+ platform the network will offer to Comcast Xfinity customers. The footage was shown during FX’s TCA executive session. A sequel set after the events of Sons of Anarchy, Mayans MC centers on EZ Reyes, a prospect in the Mayans Motorcycle Club charter on the California/Mexico border. It is still not clear which roles have been recast. Previously, the cast included J.D. Pardo, Raymond Cruz, Edward James Olmos, John Ortiz, and Clayton Cardenas. Norberto Barba is directing and executive producing the FX pilot. Reportedly, Landgraf also expressed excitement that the new TV series boasts a predominantly Latino cast and expects to order it to series in about three months. What do you think? Are you a Sons of Anarchy fan? Will you check out the Mayans MC TV show, if FX picks it up? More about: FX TV shows: canceled or renewed?, Mayans MC, Mayans MC: canceled or renewed?, Sons of Anarchy, Sons of Anarchy: canceled or renewed? Sons of Anarchy: Would Jimmy Smits Be in the Spin-off? Loved SOA, can’t wait to see the Mayan’s especially an all Latino cast! When will it air! PLEASE air this show already!! I was a big fan of Sons of Anarchy. I can’t wait for the premiere of Mayans MC. Oh YES! I loved Son’s of Anarchy! Can’t wait for the premier of Mayans MC!! Does anyone know when exactly the Mayans will air? I will certainly watch this n hopefully it stays on regular TV channel that it’s ALWAYS BEEN on. Hopefully Jax isn’t Dead n OMG I can’t wait to see this.